Ever lose your cool over a bag of something spicy? I'm talking about those little bags of whole and powdered masalas that add up to the wonder that is Indian cuisine. Just when I think I couldn't possibly buy another new spice, a recipe stumps me with the need for yet another obscure one. Like methi (fenugreek) seeds. Or anardana (pomegranate) seeds. I proceed to dry roast and grind half a teaspoon. Knowing full well that the remaining 225 gm will languish in the kitchen cupboard. The only moment I spare it a thought, or a curse, is when I swing open the cupboard door in a rush and the darned bag loses its balance and its contents spill all over me and the kitchen floor. By the time I find another recipe that needs the wretched spice, it is so anemic that I might as well not bother. Of course, this can only be worse if you live in a place where Indian spices are hard to come by and fairly anemic to begin with! 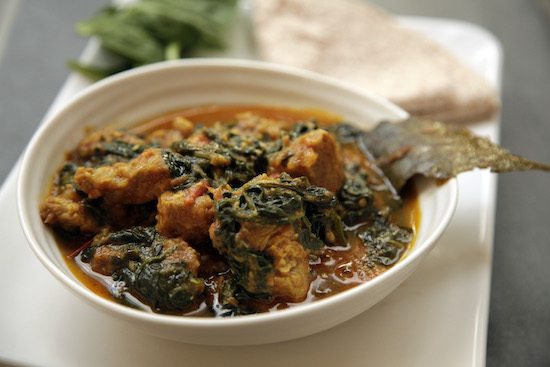 Pork and spinach curry is a real trooper when it comes to minimalist recipes. The ones that require no fancy ingredients and can be cooked when over-sized bags of fancy Indian spices are running in short supply. A hearty, winter warmer, it is a one pot curry using a few staple masalas only. Give everything a good stir in a wok or kadai. I use cubed pork shoulder steaks as they turn tender quickly and soak up the spices well. If you prefer, you can pressure cook the lot before adding spinach. This is my tweak on a recipe from Michael Pandya. A spicy treat that gaurantees a chilled out evening. Bring the oil to medium high heat. When it is hot add, in order, the bay leaves, cumin, onion and garlic. Fry for ten minutes until the whole lot starts going caramel brown. Stir in the pork pieces and brown for a few minutes until it is sealed on all sides. Now add the tomato, chilli and turmeric powders and fry for two minutes until the tomato disintegrates. Next add the spinach and the ginger. Cook this for about 10 minutes uncovered. Then stir in the garam masala and salt to your taste. You can also adjust the thickness of the curry to your preference, bubbling away the curry on a high heat if you prefer it drier. To finish, stir in butter. Sprinkle with fresh coriander and serve hot with soft chappatis. This looks like a winner even with my limited options (thanks for the link!). I’ll be looking forward to giving it a try! Thanks for all your continued efforts and the wonderful recipes! btw…abt that methi seeds and pom seeds…there are many recipes that turn delicious once added right…you can always freeze ..these days I soak methi seeds and eat them as such…very good for health dad says…so thats a nice way…but agree on what you say..at times we don’t know what to do with the ingredient that is used very rarely..
Mallika, the non-veg repertoire for this event has just begun to grow, and yours is an unusual addition. And do I know what you mean about the spices! The other thing that gets my goat are the beauty tips in magazines which prescribe a tsp of mint paste and a tsp of papaya and what not for lustrous skin, hair or whatever, I can’t buy and destroy bunches and kilos of these for a tsp, can I? Mallika!! very true mallika, you buy things which u need once or twice as the recipe you find needs one and then you can’t make the same thing again n again can we, so there you go, my one off spices n things get stored for months in my pantry and never see the daylight. Once in a while, When i realise i gotta tidy up, there comes out these things out of date or unusable. I am such a fussy girl that Mallika, I don’t make a curry if needs coriander leaves and i don’t have any. For me I gotta have all the ingrdients! !Weird eh??? I love recipes of simplicity – they know they are good and they don’t have to prove it to anyone! Sounds super yummy! I made something like this tonight with lamb, it turned out pretty good. it’d be tastier if I stewed longer till the meat are all tender. Thought only lamb goes well with this dish. I ought to try it with pork! Thanks for the post!